Hey Poncho, my dash – she no blow! The main cause for “hi fan” failure on the dash air blower is the “hi blow relay” located near the battery isolator up front. It is a silver metal unit with 5 wires on 2 connectors plugged into it. Follow the wire from the relay to the fan motor and look for heat damage on the wire. If damage is found, replace the wire and the relay. The cross # for the relay is 2411 in the Everco brand, your local parts house should be able to cross that #. If not, give us a call and I’ll send you one. How do I find out if I need freon in my dash air system to make it cool? Locate the low pressure cut off switch, it will be on one of the AC hoses under the pass. side front hood. Pull off the 2 wire connector/rubber cover of the switch and short the 2 connections in the connector socket together with the motor on and the dash AC on. If the compressor clutch kicks in (listen for it when you short the 2 connections), you need freon. How do I know I am getting vacuum to the dash AC control panel? 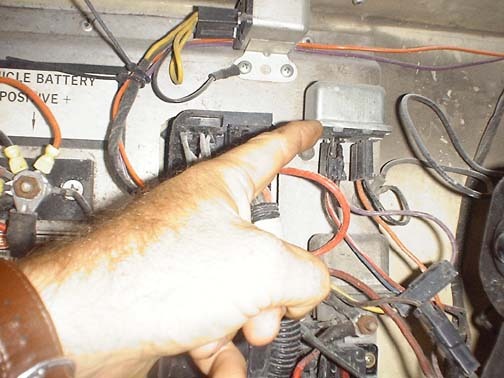 With the engine running, pull off the vacuum line going to the heater control vacuum switch located on one of the heater hoses in front of the black heater box. With the dash control off, there should be vacuum on the line to the heater valve. Now, pull off the vacuum line going into the expansion tank (black sphere bolted to the right side of the heater box up front) and see if you have vacuum going in from the motor. What does it mean when the dash AC system has no hi blow on the fan? Well, for sure there is a problem and there could be several causes but the number one cause id the “high blow relay” has probably gone out. The other speeds feed directly off of the selector switch but the high selection goes through a relay located to the right of the battery isolator. There are 5 wires (2 connectors) to the relay. Check the red/ white streamer wire for power with the engine on. If the wire has 12 volts, the relay is bad. If the wire has no power with the engine on, you need to check the alternator output. The high blow relay pulls power directly off of the alternator and will be dead if the alternator is not putting out. Why is there heat coming from the dash when the heater is off? A good one and this may also be why your AC unit does not cool well. The heater dash control feeds vacuum to the heater control valve until you want heat, then it cuts off vacuum and allows hot water to reach the heater core. So, in the absence of vacuum, heat flows. Guess what, I know its hard to believe but after so many years, the vacuum to the heater valve can many times be weak thus you have heat. The switch could be off but with how water in the heater core you will have heat from the vents. Install manual shut off valves on the 2 hot water hoses going to the heater box, in the summer this will stop all hot water from reaching the heater box.